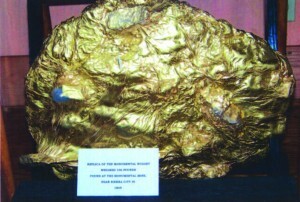 The largest gold nugget ever found in Sierra County, known as the “Monumental”, weighed 106 pounds and was discovered on the Sierra Buttes Mine property at approximately the eighth level in 1869. 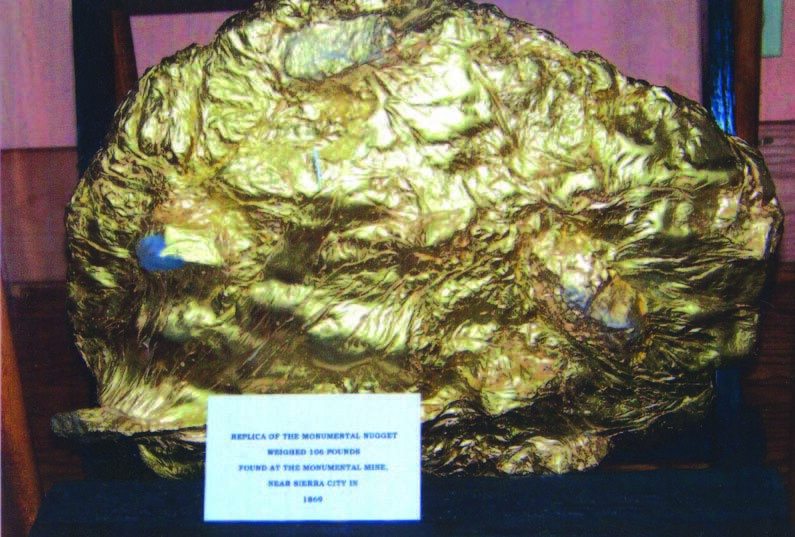 You can see what this monumental chunk of gold looked like when it was brought from the ground when you visit the Kentucky Mine Museum to view the carefully crafted, life size replica now on display. According to Carroll Hayes, whose family purchased the Sierra Buttes Mine in 1904, miners on their way to work at the mine saw a portion of the nugget on the trail after rain had washed away the dirt that had been covering it. They quickly began unearthing the rest of the nugget and couldn’t believe their eyes when they saw the “Monumental” chunk of gold. Experience that same sense of awe when you see the incredible “Monumental Nugget”!